Summary: Pet dander can cause some serious health concerns, especially if you or your loved ones suffer from allergies. While owning a pet comes with the perk of companionship, there are also plenty of setbacks too. Pet dander can be one of the most unpleasant things to deal with, especially if your loved ones suffer from pet allergies. Worst of all, if it’s uncontrolled, it could latch onto everything it lands on. Now, this factor makes it nearly impossible to get rid of but there are things that you can do to ensure that your home remains clean to the point where dander isn’t an issue. Iron King Kennels, a premium pitbull specialty business, has shared some of the latest and greatest tips that will help keep your home free of any sheddings. One of the easiest ways to get rid of pet dander from ceilings, walls, and solid furniture is by wiping it down with an all-purpose cleaner and rag. Preferably if you can, utilize a cleaner that’s formulated with naturally derived ingredients to make your environments safe for both you and your pet. Ask pitbull breeders or any other specialty breeders what they recommend for your home, as they’re likely to use the product for their household as well. Upholstered furniture and curtains require a different approach. There are a number of hair removal products on the market but the easiest, and cheapest, way to get rid of all the dander is to use a lint roller with some sticky tape. Roll it over the surface of the furniture and curtains to pick up any pieces of protein or skin that’s shed by your pet. Most homeowners tend to neglect their curtains due to the fact that they’re not necessarily prioritized. While it may be tedious, it could be especially helpful for those that are susceptible to allergic reaction. Summary: There are three main types of cushion filling: foam, feather, and polyester fiber. Foam is the most popular and resilient, while feather and fibers form part of the filling for comfort. 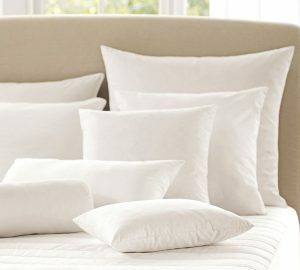 The most comfortable cushions come with down but are also the most expensive. There are three main types of cushion fillings: Foam, fiber, and feather. In the majority of cases cushion, inserts will use a combination of at least two of these fillings. The combinations vary and will depend on the cost, level of comfort, and the durability the customer expects from the cushion. Let’s take a look at the main fillings and their characteristics. Foam is the most popular cushion filling by a wide margin. The popularity of foam is due to its resilience, and the ability to mold it into any shape or size. It is also easy to manipulate, even at home, which makes it very popular for DIY projects. Feather and fiber are popular for seat and back cushions, for their comfort and softness. However, they do require regular plumping to maintain shape. The biggest issue with feathers is that a lot of people have some form of allergy and only realize it after they buy the cushions. For the ultimate in comfort, people should buy down cushions. As the premium choice in cushion filling, they are also the most expensive. Down cushions require more maintenance than others, with pure down cushions requiring daily maintenance. Written by The Foam Factory. Get the insert for your next cushion from the specialists in foam.